Malala Yousafzai 21, is an international icon for her brave efforts advocating for children’s right to education while living under dangerous circumstances. A girl born and brought up in a country where only boys were given the right to education with the Taliban dominating the law, Malala had very few supporters as she started protesting against the extremist force oppressing her countrymen. The Taliban made an attempt to suppress her with their violence, but Malala instead of giving up chose to fight back with her power of words. Malala’s story is the awe-inspiring story of a schoolgirl who had a firm belief in her power to change the world. Malala Yousafzai was born on July 12, 1997, in Mingora, a city in the Swat District of Pakistan. She was born at home since her family couldn’t afford a hospital. 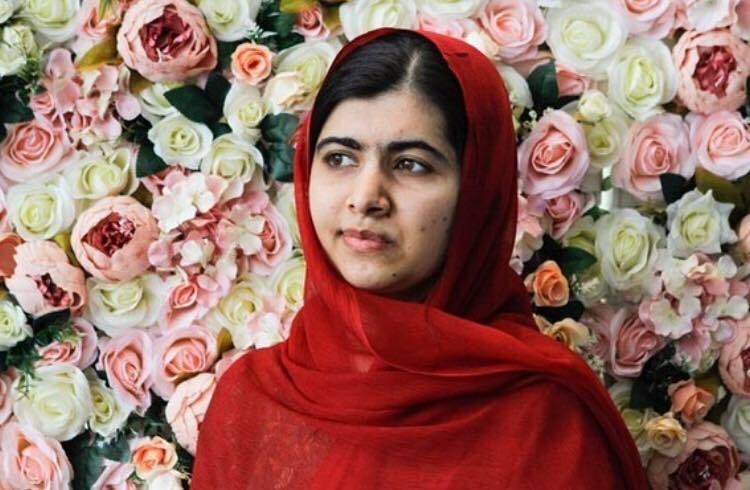 She was named Malala after Malala of Maiwand, a national folk hero who led local fighters to victory in Afghanistan. Her parents were unaware that their daughter would also become a hero for her country in the coming years! Malala was highly inspired by her father, who was an activist believing that the lack of education was the root of all of Pakistan’s problems. She got her education in a public school founded by her father and was a bright student from an early age. She loved books and wanted to become a doctor. Her father felt that his daughter had a gift for something extraordinary. He made her think openly and to express her political opinions freely. After her father made Malala’s two younger brothers sleep, he and Malala stayed up discussing politics late into the night. During 2007, when Malala was just ten, her hometown started to witness change as Taliban militants came closer. Soon the Swat Valley was hit by violence and threats were given to shut down girls schools. Even though Malala was a young girl she knew that if she kept silence like everyone else, nothing would change. So Malala looked for bigger platforms where her voice could promote education for girls. In 2008, her father received a petition from BBC Urdu for a student to blog about his/her life under the Taliban. No one dared to speak against the Taliban but he knew Malala would. In 2009, at the age of 11, Malala began to anonymously write about the horrific reign of terror in her hometown. Every week, she gave her notes to a BBC reporter, writing everything from her views on education to the terror shown by the Taliban military. During Malala’s months of blogging, the Taliban’s hold on her country increased. In her posts, Malala described the sounds of gunshots and mortars at night, the destroying of around 400 girls’ schools, the dead bodies of beheaded policemen in her town, and the widespread bans on sources of entertainment and education like the television, music, and women’s education. In course of time, the Taliban allowed girls to receive a primary education — but only on the condition that they wore burkas. Malala’s writing gave new hopes, as girls began to attend school again. Malala’s blog ended in March 2009. By that time, her posts had received international attention and she was given an opportunity by New York Times reporter Adam B. Ellick to get featured in a documentary. Meanwhile, Malala Yousafzai and her family were displaced from their hometown Swat as the Pakistani army tried to regain control of their region. She stayed in the village, feeling bored without her books. Her father protested and lobbied for support in Peshawar. At this time, Malala decided to enter politics instead of becoming a doctor. The same year, the documentary based on her was released and was widely acclaimed. It came to light that Malala was the student behind the BBC Urdu blog and she gained popularity in Pakistan. In the next three years, she and her father became famous throughout Pakistan for their strong campaigning for change. Malala Yousafzai’s voice gained popularity, and she was awarded Pakistan’s National Youth Peace Prize in 2011. The Taliban were furious at Malala’s candid criticism of them. Soon, they began to give her death threats. They published warnings against in the newspapers and slipped threatening notes under the door of her home. Her parents got scared and asked Malala to back down to avoid any mishap, but the Braveheart girl refused. Her courage was stronger than their fear of the Taliban. In spite of all the threats, Malala continued to raise her voice in support of every girls’ right to education. On October 9, 2012, Malala was returning home from school on a bus with her friends when a masked gunman entered the bus. He pointed a gun at the girls and demanded to know who was Malala. As her friends turned to look at Malala, he fired three shots. One bullet hit Malala on the left side of her head, going down her neck and settling in her shoulder. Everyone got terribly scared as she collapsed and the gunman escaped. In an ambulance 15-year-old, Malala was airlifted to a military hospital in quite a critical condition. After a 5-hour long operation, the bullet was removed, but her condition wasn’t stable. Her organs started to fail, an infection developed, and she was kept in an induced coma. Many countries offered to treat Malala and she was transferred first to Germany and then the United Kingdom for her treatment. Malala’s murder attempt met with worldwide outrage and protests across her country. A right-to-education bill was passed in Pakistan for the first time, and she now receives international support for promoting her cause. On her 16th birthday on July 12, 2013, Malala went to New York to give a passionate speech at the United Nations, in which she urged the world to challenge extremism with education. In the same year, she published her first book, I Am Malala: The Girl Who Stood Up for Education and Was Shot by the Taliban. Malala Yousafzai has become a peace icon and a leading spokesperson for girls’ right to education winning over 40 honorary awards. The young activist has funded education projects in six countries and keeps raising her voice to empower girls to become agents of change in their communities through her own non-profit Malala Fund. Currently, Malala lives in Birmingham, UK, where she has been proudly accepted to Oxford University. At Oxford, she will study Philosophy, Politics, and Economics to broaden her perspective and continue her advocacy for education. Malala has always shown exceptional strength and courage in the face of terrorism. The attempt to end her life only emboldened her belief in a more equal world. Her voice has helped in the education of thousands of children and inspired many more. Malala Yousafzai is proof that age has nothing to do with the fight for the right cause and anyone can raise their voice to improve the world around them. She is such a brave young women. What a great role model for girls to look up to. My heart goes out to Malala, she is so brave and a courageous young woman. Such an inspiring person! She’s seriously incredible! She’s making such a difference in the world and she’s just amazing! This girl is so brave and what is in her mind is that she tries to show the way it should be. Hope the truth is always with her way.. I have read articles and watched videos about Malala and I, myself has been really moved by this woman’s bravery and courage. Very one of a kind and exemplary. I hope all women can be as brave as her to defy evil with words and cause no harm to others. Malala will always remain a source of inspiration for generations to come…very well articulated…..
She is such an inspiring women! I actually didn’t know about the book, I need to read it. I also know some young women who may be getting a copy from me! This is just beautiful! I feel so inspired. I read every word of this post, fascinated by Malala’s life and your ability to capture it. I thought I knew her story but now have an even more profound respect for her work in women’s rights and education for all. Malala is a great example for all women and for humanity in general. I loved her first book, it provoke in me some disgust for the world violence in general but also such a huge HOPE because while there will be people like Malala in the wolrd, there will be HOPE. Definitely a strong female figure of inspiration for our generation and the future. This girl is so brilliant. Incredibly well-spoken and brave for her age too. I’ve been wanting to learn more about her for a while, now. Your post was incredibly insightful and informative, thanks for sharing. I am speechless after reading this story. She is truly an inspiration to all of us. Despite the challenges of the world facing today because of terrorism. She was still a heart for others. I had heard about her struggles and achievements before, but this post crisply enunciates what she has been through and what she has achieved. Just amazing! She just such an incredibly amazing person. My daughter had to do a school essay on Malala last year and I swear her whole outlook on life changed completely when she did the research. Wonderful, wonderful woman and so inspiring for all of us. So nice to see all information and photos put together here on Malala. She is certainly an icon. I’m speechless as to the courage of some and the cowardliness of others! It should give us all hope that there are still those who embody goodness in this world! Great story and so inspiring! I’ve heard about her in passing and this is a great in-depth read. Thanks for posting. Her speech at the UN was so moving, and like Sec Gen Ban Ki Moon, we are all in administration and praise for Malala’s exceptional bravery. The more I learn about her the more inspired I am … They was/is courageous indeed! i have been a huge fan of malala and have been every post about her childhood. At one point it was said malala was a fake because it was her father who wrote what she stood to speak about. But that too takes braveness is a girl to stand up and against terrorism. Inspiring woman and post. Thanks for sharing. Books, Not Bullets! This is such a good read. Great and informative indeed. Very well written! Malala is born with exceptional strength and courage. She is an inspiration for all of us. Malala has such a great heartwarming and inspirational story. Great post, loved it. An amazing, strong woman and someone who my girls can look up to. Thanks for sharing the story. Malala was used as a point of discussion before in one of my English classes so I am a bit familiar with her story. Her bravery is amazing and she definitely made a huge difference.